Wild hogs are everybody's problem! This brochure, seen below in digital form, was made possible by a cooperative effort with the Michigan Wildlife Conservancy, Mauser Harmony with Nature Foundation, Michigan Pork Producers Association, and Michigan Farm Bureau. 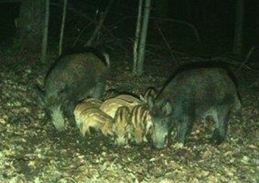 A presentation about the wild hog problem can be accessed here. The Wildlife Conservancy is asking citizens to report the presence of wild hogs to USDA Wildlife Services at 517-336-1928 or via email at timothy.s.wilson@aphis.usda.gov. Wild hogs are nomadic, that is, they don't stay long in any location. So, it is important that citizens report wild hogs immediately when they spot animals or see hog sign.